LAS VEGAS, NV (APRIL 20, 2016) – It’s Strawberry Fest at Coco’s now through July 3, 2016. – Made for the hungriest of guests- Featuring three buttermilk pancakes topped with fresh glazed strawberries and fresh whipped cream. This dish is served with three eggs any style, seasoned breakfast potatoes, hash browns or fruit wedges, three slices of Coco’s thick cut bacon, and three sausage links or turkey sausage patties. – Try the thick slices of rich brioche bread dipped in egg batter and grilled golden brown. Dusted with powdered sugar and topped with fresh, glazed strawberries and fresh whipped cream. Also served with two eggs any style, and a choice two thick cut bacon strips, sausage links, or one turkey patty. – Featuring rich cheese blintz filling and fresh glazed strawberries folded inside two German crepe-like pancakes and lightly dusted with powdered sugar. Topped with even more fresh strawberries and served with two eggs any style, two slices of thick cut bacon, two sausage links, or one turkey sausage patty. Nothing says Strawberry Fest like Fresh Strawberry Cheese Blintz German Pancakes! – Not in the mood for pancakes? No problem. Try this golden Belgian waffled topped with fresh, glazed strawberries and whipped cream. Also served with two eggs any style and a choice of bacon, sausage, or turkey sausage. – For the guest looking for a little green in their lives, this salad features fresh summer greens tossed with our berry vinaigrette and topped with fresh sliced strawberries, sliced chicken breast and balsamic reduction glaze. Also served with flatbread diamonds. “If guests stick to the same dishes but want to live on the edge a little bit,” said Thomas Soraci, Director of Marketing for G2G Management Group. “Guests have the option to enhance their usual dishes by adding fresh glazed strawberries to any of their griddle favorites for $1.99.” To wash everything down, strawberry lemonade does the job nicely. 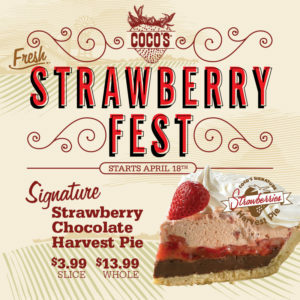 And because pie makes everything better, Coco’s signature Strawberry Chocolate Harvest Pie is back. Flaky pie crust filled with dark chocolate ganache, a layer of glazed strawberries and Coco’s signature strawberry mousse. Topped with fresh whipped cream and available in slices or whole pies. To top off Strawberry Fest, Coco’s additionally offers Strawberry Cheese Pie, Strawberry pie, Strawberry Coffee Cake, and Strawberry Muffins. It all began back in 1948, with one little restaurant along Pacific Coast Highway in Orange county, California. Today, there are over 70 Coco’s Bakery Restaurants in the Western United States including California, Arizona and Nevada.